Middle-Atlantic makes the very best in racking systems, to enhance workspace fluidity. 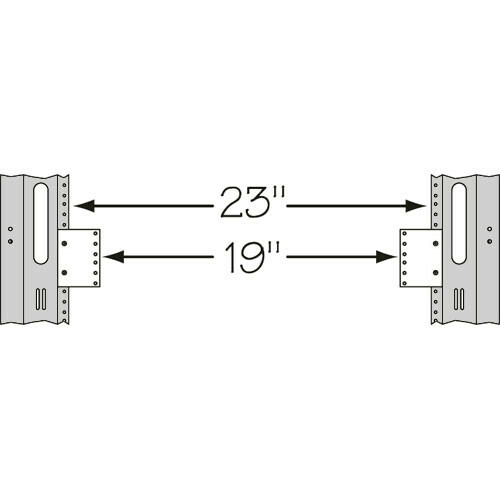 This 23 to 19" 2U Space Reducer fits any ZRK Middle-Atlantic rack and sits at 3.5 "H (2 spaces). This easy module slips into 23"W racks and reduces their size to a 19"W rack. With filler features such as these, it's easy to modify your racking standards--but never lower them; go with Middle-Atlantic. Making sure that your every electronic component is safe doesn't have to be difficult; Middle-Atlantic uses the highest-quality steel for each of its racking components. Have a 23"W ZRK rack that you wish was a 19"W so your devices fit more snugly? This insert solves sizing issues in one quick fix. Box Dimensions (LxWxH) 3.5 x 2.5 x 0.25"